The expansion Seattle franchise doesn’t yet have a single player, but they do have a team award. The management group announced today that the organization will hand out a Guyle Fielder Award every season to the “player that embodies the sportsmanship and leadership of one of Seattle’s greatest hockey legends.” If you don’t recognize Fielder’s name, you’re not alone, as his story is one of the most overlooked in hockey history. Fielder stands as the fourth-leading scorer in professional hockey history, recording 1,929 points over a long career spent mostly in the minor leagues. In fact, he didn’t register a single one of those points in his 15 NHL games, but routinely led the Western Hockey League—not the junior league it is today, but a minor professional one—in scoring. He played for the Seattle Bombers, Americans and Totems over his career and is a legend in the area for any hockey fan old enough to remember. Though there may be some Toronto Maple Leafs fans hoping Mike Babcock would find his way somewhere else today, Pierre LeBrun of The Athletic cleared up some confusion about the head coach’s contract. Babcock does not have an out clause in his contract as some had speculated, and “remains as committed as he’s always been” to leading the Maple Leafs. The team was eliminated by the Boston Bruins last night for the third time in six years, and still haven’t progressed past the first round since 2004. Babcock has four seasons left on the massive eight-year, $50MM contract that he signed with the Maple Leafs in 2015. The Carolina Hurricanes didn’t hold a morning skate today as they prepare for Game Seven against the Washington Capitals, so there wasn’t a chance for Andrei Svechnikov or Micheal Ferland to get back on the ice. Head coach Rod Brind’Amour told reporters including Chip Alexander of the Raleigh News & Observer that he isn’t sure whether Svechnikov will be ready to play tonight, but Ferland will probably not suit up in the do-or-die elimination game. The Hurricanes will rely on their captain Justin Williams, who has often been dubbed “Mr. Game 7” for his heroics in these situations, but has also been one of the team’s best players through the first part of the series. If the Hurricanes win it would mean that all four wild card teams have advanced to the second round, showing just how wide open the Stanley Cup playoffs really are. The Winnipeg Jets were knocked out of the playoffs last night by an impressive St. Louis Blues group, and now must face the harsh reality of another season wasted. 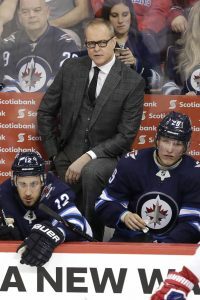 The Jets will not be happy with just making the playoffs in a season where many had them as a Stanley Cup contender, and will have plenty of questions surrounding the organization as the offseason begins. Is Paul Maurice the right man for the job? There’s no doubt that Paul Maurice is a good coach. The Jets’ head man has been behind NHL benches for most of his professional life, first taking the reins of the Hartford Whalers in 1995 when he was just 29 years old. His 695 wins put him seventh all-time among NHL coaches, behind only Joel Quenneville and Barry Trotz among those active. He’s ahead of names like Mike Babcock, John Tortorella and Claude Julien. For all his regular season success though, Maurice has plenty of failure on his resume too. His teams have finished below .500 in a full season six times, and his overall record in the playoffs is 36-44. The team found some success last season as they made it all the way to the Western Conference Final, but that was just the third time in his entire NHL career that Maurice had made it past the second round of the playoffs. Now with another disappointing exit, the coaching seat in Winnipeg is sure to feel warm over the next few weeks and months. How much are they willing to commit to Laine, Connor and Trouba? Patrik Laine, Kyle Connor and Jacob Trouba are all set to become restricted free agents this summer, and should all command huge dollar figures and term. Each one of them is a potential star at his position, but each also comes with some real red flags. Trouba’s are perhaps the easiest to see after his previous tough negotiations and hesitancy to commit long-term to the Jets. The 25-year old defenseman has wanted to be “the guy” on the right side, a position that the Jets are deep at with Dustin Byfuglien and Tyler Myers among others. Laine has had his ups and downs all season, going through drastic slumps while also still showing why he is a potential superstar. While he hit the 30-goal threshold for the third time in his three-year career, he also had his lowest point total (50) and was a -24 on the year. His negotiation will be particularly interesting to see if the two sides even want to ink a long-term deal after such a disappointing year. Connor meanwhile led all Jets forwards in scoring during the playoffs and has developed into a key cog on offense. The biggest question surrounding his negotiation will be as a direct comparison to Laine. Doesn’t the 22-year old former Michigan star deserve more money after the year he just completed? How will the Jets afford to pay both of them, while also watching an extension kick in for Blake Wheeler raising his cap hit to $8.25MM. Is that too much money to spend on the wings? What about the unrestricted free agents? If those three RFAs weren’t enough, the Jets also have some important unrestricted free agents to worry about, starting with Myers. The hulking defenseman is set to hit the open market in July and could arguably be the best blue line option available, depending on how things go with Erik Karlsson. While he had another strong season for the team, if they are looking to shake things up perhaps they decide not to bring him back and instead install one of their younger defensemen like Sami Niku on a full-time basis. There is also Kevin Hayes, whose upcoming free agency leads to another question about the Jets. How are they going to fill that second line center role, after using rentals in each of the last two years? Hayes was acquired for a first-round pick this season after the team spent the same on Paul Stastny the year before, only to see both fail to bring them a Stanley Cup. Bryan Little is still under contract for five more years at a $5.29MM cap hit, but GM Kevin Cheveldayoff has obviously not been content with him in the middle of the second unit. It doesn’t come as much of a surprise that the Tampa Bay Lightning will be keeping Jon Cooper in his current role as head coach, but historic collapses can make teams resort to drastic measures. Even after the team’s unbelievable loss at the hands of the Columbus Blue Jackets, Lightning GM Julian BriseBois left zero doubt in his faith in Cooper, explaining that he would be trying to sign him to an extension today if he hadn’t already done so. “There’s no sense in looking for the next Coop when I have the original,” BriseBois told reporters including Caley Chelios at his season-ending media availability. Cooper’s contract was set to expire before the two sides agreed to a three-year extension just before the start of the playoffs. Even though the team fell apart in four games against the Blue Jackets, they still had a historically-good regular season with a 62-16-4 record. Though he still doesn’t have a Stanley Cup on his resume, there is little doubt that Cooper is one of the best coaches in the league. In 508 career regular season games behind the Tampa Bay bench he has a 305-159-44 record and has taken the team deep in the playoffs three times including to a Stanley Cup Final in 2015. The Lightning have plenty of decisions to make this summer when it comes to their roster, given the drastic raises that players like Brayden Point have earned, but they won’t be blowing things up. Cooper will still be behind the bench to try and take the team to a championship and will likely face very little controversy unless they get off to a horrendous start. The World Junior Championship is one of the greatest hockey tournaments on the calendar each year and it’s an honor to represent our country as head coach. Last year, we fell just short of our goal, so to have the opportunity to come back and get another chance at helping our country win a gold medal is exciting. The expectation for the United States in this tournament is to contend for gold and I’m excited to begin the process towards continuing the success those before us have established. Paul Maclean is heading back behind the bench. The Jack Adams Award-winning former NHL coach is expected to be named the head coach and general manager of the QMJHL’s Cape Breton Screaming Eagles, Sportsnet reports. Maclean, a native of nearby Antigonish, Nova Scotia, will replace Marc-Andre Dumont in both roles, after he was fired today following the team’s playoff exit. Maclean last coached in 2016-17 as an assistant for the Anaheim Ducks, but spent four seasons as the head coach of the Ottawa Senators, including his Jack Adams campaign in 2012-13, and had previous stops as an assistant with the Detroit Red Wings and a prior stint with the “Mighty Ducks” as well. His addition is a major boost for Cape Breton, a club without much of a winning history. The Screaming Eagles are still looking for their first QMJHL Final appearance since joining the league in 1997 and hope that Maclean can take them there and potentially win them a title. It’s going to be an embarrassment of riches in net for the Boston College Eagles for the next few years. Despite losing star keeper Joseph Woll to the pros, the Eagles were already set to add Spencer Knight out of the U.S. National Team Development Program as their new starter next season. Knight is considered a generational talent in goal and expected to be first-round pick in this year’s NHL Draft. However, the Eagles also landed a 2020 commitment today from Henry Wilder, recently tabbed by NHL Central Scouting at the No. 14 draft-eligible goalie in North America. While that ranking doesn’t necessarily mean that Wilder will be drafted, it is a distinct possibility. Either way, BC will undoubtedly have one of the top young tandems in all college hockey, if not all of amateur hockey, in two years time. If Knight lives up to his billing in the NCAA, he is unlikely to last four years with the Eagles, but Wilder is now an excellent fallback plan. The athletic young netminder just finished a strong season at The Hotchkiss School in Connecticut and will have one more year of development under his belt before arriving at BC to form a formidable duo with Knight. The Tampa Bay Lightning are on the brink of elimination. After a season that saw them lose just 16 games in regulation, the team is down 3-0 in their series against the Columbus Blue Jackets and will need to win four straight to avoid a historic collapse. Unfortunately, they won’t have their best defenseman in the lineup to help out. Victor Hedman has been ruled out again by head coach Jon Cooper, who also notes that Anton Stralman will not play and Alex Killorn is a game-time decision. Hedman was injured against the Washington Capitals on March 30th and missed the final few games of the regular season, but suited up in the first two games of the series. Even though he was on the ice the Norris-caliber defenseman was clearly not up to his lofty standards, and now could potentially watch his team get swept out of the first round without being able to help. The Blue Jackets have a chance to make history by knocking the Presidents Trophy winners out in four games, and will do it on home ice. Luckily, if you can call it that, the Lightning will get some help back in the form of Nikita Kucherov. The potential Hart Trophy winner will be back after missing game three due to suspension, and will try to get his first points of the season and help Tampa Bay stave of elimination. Kucherov has been a solid playoff performer in the past, recording 58 points in his first 58 postseason games but now has just a single assist in his last six going back to last season.